The bathroom is a place of solace, but also a place of functional necessity. ProSource® of Brevard carries a wide variety of bathroom remodeling products to help with your project, ranging from sinks, sink faucets, showers, vanities, tubs, and more. There’s no better place to get the germs off hands then the bathroom sink. 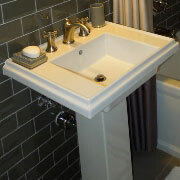 Why not make the hand washing experience enjoyable with a quality bathroom sink? From the simplest of designs to ultra-modern sink shapes, check out your options at our Brevard showroom. Of course, if there’s a sink, you’ll need a faucet to accompany it. 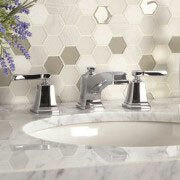 Bathroom sink faucet options range from simple and contemporary all the way to modern and refined. Design and function can be brought together with the right choice from ProSource. If you’re searching for the right shower head, base, door, or even handles, ProSource is sure to have what you are looking for. The vanity area is a place to reflect — literally — and manage the stage of preparing for the day. 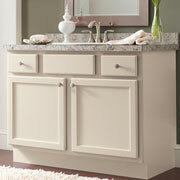 From counter space to storage, ProSource can help you remodel the perfect vanity space. Stand-up showers are nice and efficient, but there’s nothing as relaxing as a bathtub. 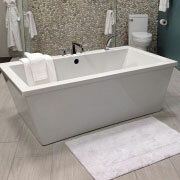 Visit our Brevard showroom to shop a wide variety of tubs, in a variety of styles and features, to create the ideal bath remodel. Above all else in the bathroom, the toilet is arguably the most important part. 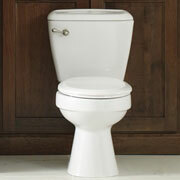 With toilets ready to transform your bathroom remodel, our wholesale showroom is the right place to be.